Rosh Hashanah, the Jewish New Year, falls on the Hebrew calendar dates of 1 and 2 Tishrei. We recommend sending best wishes with a Rosh Hashanah bouquet. Professionally arranged with impeccable care. 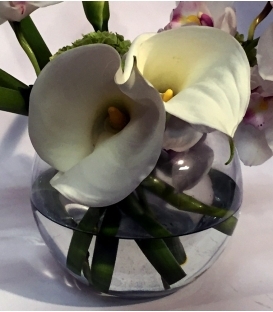 Classy, elegant arrangements are constantly being created and shipped out all over Montreal all week long. During this holiday, it is very popular to send flowers to family, close friends and business associates. Our bouquets will be made with local cabbages, roses, berries, hydrangeas, orchids, lisianthus from Israel or any other flowers which have that rich fall feeling.